you authenticate as a user with the "Full Administrator" role with the user name Administrator and the password password (of course you should use different credentials for your installation). The Analytics Workbench - like the Query Workbench - provides a graphical user interface for query development. To access the Analytics Workbench open a browser and go to http://localhost:8091, log in, and select the Analytics menu in the Couchbase Web Console. You must press the Execute button in the Analytics Workbench. Unlike Query Workbench, pressing Enter or Return will not immediately execute a statement because Analytics accepts multi-line statements. You can use the command line tool, cbq, to run queries. cbq is the command line shell for executing queries against the Query service as well as the Analytics service in Couchbase. $ cbq -u Administrator -p password -e "http://localhost:8095"
Here you can see that the result shown in the Analytics Workbench is embedded in an envelope that contains additional information about the request like the requestID, the status, and some metrics. 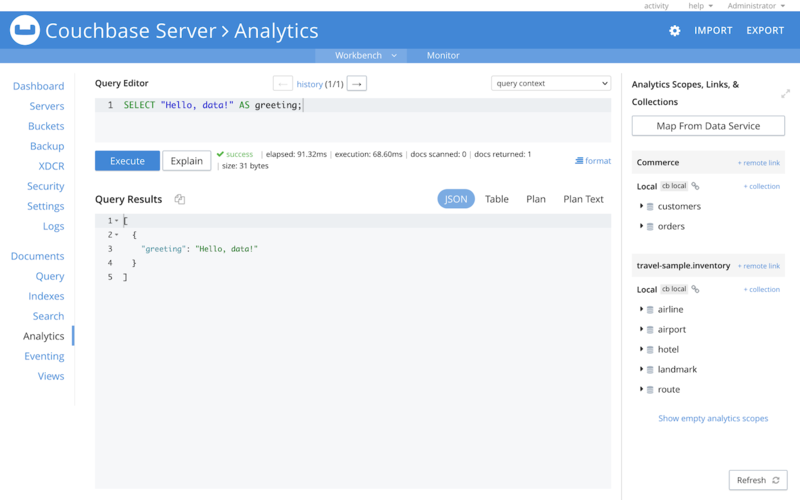 You can use the REST API to run Analytics queries. When the cluster is up, requests can be posted to Couchbase Analytics. Access http://localhost:8095/analytics/service that implements the same HTTP interface as the Couchbase Query service. For details, see Analytics REST API.